The 5k run and walk and 1K Fun run to end child abuse…….coming to Genesee County on Saturday, April 27nd 2019!!! BIGGER and BETTER than ever. One of the fastest growing and most family fun events in Flint will be returning on Saturday, April 27, 2019. We have an interesting course, a great venue, and the event will be bigger and better than ever! Every finisher will receive a custom finishers medal. The 5K Run will be a timed event with age-group awards. The family friendly 1K Family Fun Run will remain a non-competitive event. 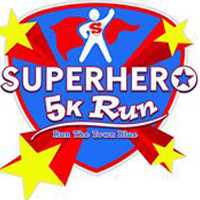 The Flint Superhero 5K Run promises to provide more fun for the entire family.